Welcome to the 2019 Bradford Home & Lifestyle Show! We’re proud to offer this showcase of Bradford West Gwillimbury & Area Businesses. As a Sponsor and Vendor, please read our Terms & Conditions. PRIORITY, EARLY ACCESS REGISTRATION is now open to BBT Members and Previous Vendors of our 2018 Show. Registration Open to the public: Monday, January 21st, 2019. Please note: Applications by non-members and were not vendors of our 2018 show who submit their applications before Monday, January 21st, 2019 will not be reviewed until after the deadline. EARLY REGISTRATION HAS ADVANTAGES! The earlier you register, the better your booth placement at the show. Booths are 10′ wide, 8′ deep, double booths are 20′ wide, 8′ deep. Cap ends of aisles are available for double booths which will be 16′ wide, 10 ‘ deep or booths within the aisles will be 8′ deep and 20′ wide. We only allow 3 businesses of any one type. We want to ensure everyone has ample exposure with minimal direct competition. Further details can be found in our Terms & Conditions. 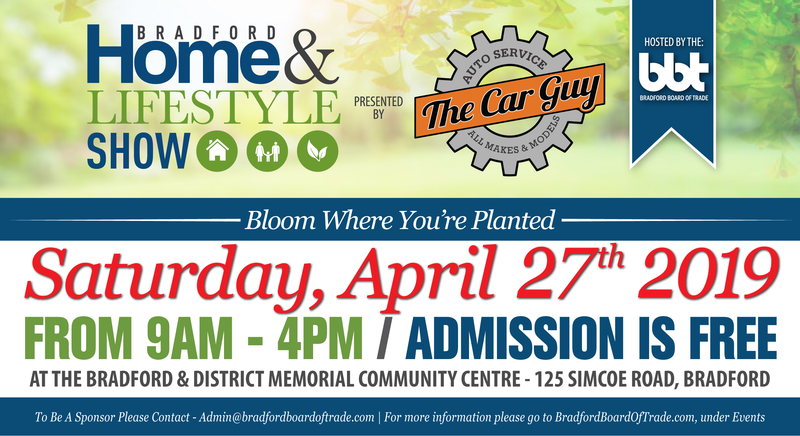 Invitations have been sent to our past vendors and members in good standing with the Bradford Board Of Trade for early access registration. Boneyard Event Services is returning as our official show services contractor for another year. They’ll be happy to set up your booth with everything you need. To book show services (carpet, tables, chairs, coat tree, waste basket, etc.) for your booth. Electrical Services are to be announced. I am a food vendor and acknowledge that I will be required to get approval by the Simcoe Muskoka District Health Unit. All prices are subject to HST (13%) - totals will be calculated when you are forwarded to PayPal upon clicking Submit. If you are writing a cheque, please use the total generated on the PayPal page. You will be forwarded to PayPal, regardless of your payment selection. Sponsorship Referral, Whom may we thank? 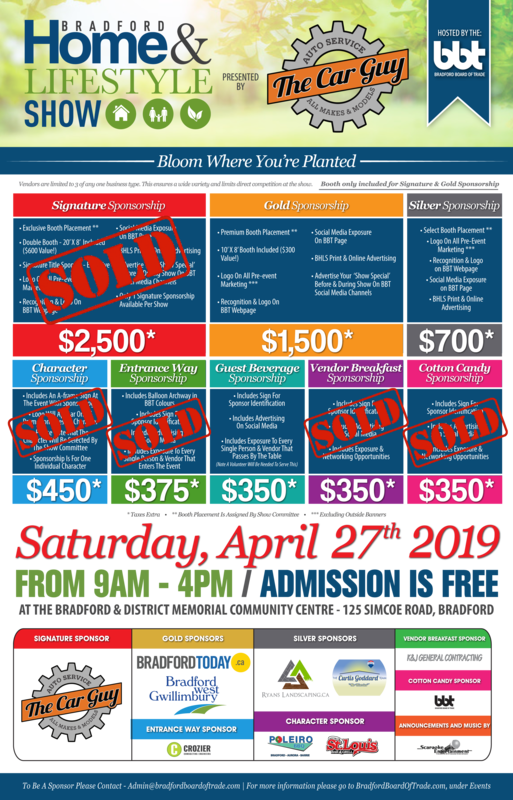 Please make your booth selection:Early Bird Member Booth: CLOSEDEarly Bird Non-Member Booth: CLOSEDRegular Member Rate: Full payment $250 + HST after Friday, March 1st at 5pm.Regular Non Member Rate: Full payment $350 + HST after Friday, March 1st at 5pm.My booth was included in my Signature or Gold SponsorshipNo thank you, I don't want a booth. * Please note that all early bird bookings will be cancelled if not paid in full by the closing date. You will be required to rebook at the regular rate. I understand that by submitting my application for a booth and payment that I am in turn agreeing to the Terms & Conditions of the Bradford Home & Lifestyle Show. My application will be considered once payment is received by the BBT in full. I also understand that my booth placement will be considered by the committee in the order of payments in full received, after sponsors. I understand and accept the risk of losing my spot if another business applies and pays before me. Early Bird bookings will be cancelled as of Friday, March 1st, 2019 at 5pm if payment in full has not been received by our office. You will be required to rebook at the regular rate. Businesses will be limited to three (3) per business type in order to limit direct competition at the Bradford Home & Lifestyle Show. Should my application be declined by the show committee, my payment will be refunded. Cancellations and refunds cannot be offered beyond Friday, April 5th, 2019 at 5pm. Cheques can be made out to: Bradford Board Of Trade; And mailed to: 61 Holland Street East, PO Box 1713, Bradford, ON L3Z2B9 The Bradford Board Of Trade is not responsible for delays in mail service should payments not arrive in a timely manner. It is the vendors responsibility to ensure payment is received by our office by posted deadlines. You are not required to have a PayPal account in order to pay online. Click on the grey \"Pay with a credit or Visa Debit card\" button. I do not agree and will not be participating in the show.